Abstract: While not something for the novice to undertake, flashing your video card BIOS may lead to performance and feature enhancements. We recently ran an article on flashing (reprogramming) the BIOS (Basic Input/Output System) of your motherboard to enable new features and fix errors. That got us thinking that we'd only covered half the story. Sure, hardware enthusiasts have been upgrading the BIOS on their motherboards for years, but what about the other components of a computer system? Video cards in particular have an interesting history in relation to the BIOS flashing procedure. While motherboard BIOS fixes generally add support for new processors and fix hardware glitches, video card BIOS updates have the potential to do much more. Enterprising tech-heads have discovered instances where a video card can actually be transformed by a BIOS update, activating hidden features and potential buried performance aspects by the manufacturer (generally for marketing purposes) . In this article, PCstats will describe the process of flashing (re-programming) your video card's BIOS chip. 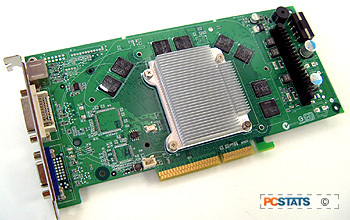 We cover the potential benefits and risks of the procedure, as well as specific steps for both ATI and Nvidia cards. In case anything goes wrong, a troubleshooting section brings up the rear, and may save yours. What Does A Video Card BIOS Do? Before an Operating system like Windows XP loads and the software drivers take control of your video card's functions, the video BIOS initializes the card. As soon as it receives power from the motherboard, the BIOS activates the card and identifies itself to the motherboard BIOS. At this point, the graphic processor and video memory clock speeds are also set by the BIOS, though these may be overridden by the drivers or other utilities once the operating system has loaded. In short, the video BIOS starts and identifies the card, and provides its initial crop of settings. In the current age of the unified video driver, where manufacturers like ATI and Nvidia provide a single set of drivers for all their video products, the way the video drivers interact with a card also depends on how the card is identified by the BIOS. Thus, 'new' features can be activated by using a different BIOS on the same Graphics processor. Well, there are several good reasons to flash your video card's BIOS. For one thing, some manufacturers have and will release BIOS updates for their video cards, though this has become considerably rarer in the last few years. These updates may increase the stability of the card, eliminate glitches and problems, and possibly increase performance. A more compelling reason is the lure of getting your video card to perform to its maximum possible potential. Video card manufacturers have been known to create artificial product divisions, whereby the same model of Graphics processor is packaged with different memory and BIOS settings to create a higher end and lower end version of what is essentially the same item. As the video BIOS governs the speeds the GPU and memory can be set to, changing this can have a huge effect on video card performance and overclockability. The same graphics processor can be set to run at a lower speed so that the company can have entry level and high-end versions of the same part without the expense of commissioning two different graphics core designs. A good recent example of this sort of thing is with ATI's Radeon 9800 PRO and Radeon XT cards. Many 256MB 9800 Pro cards (and some 128MB ones too) actually use the same graphics processor core as the 'faster' and more feature laden 9800 XT cards. A simple BIOS flash will increase the speed of the card and enable features that were not previously available to the 9800Pro, like temperature monitoring and the 'overdrive' driver overclocking option. Please note that this is a possibility specific to the one type of video card only, and cannot be duplicated with other products. Similar processes exist for various other types of video cards though. A quick bit of research on the Internet will turn up many accounts of this. It's fair to note at this point that many of the gains achieved by successfully flashing a new BIOS onto your card can be directly attributed to the new BIOS increasing the GPU and memory speeds. These gains can also be realized with overclocking, at less risk to the card. What cannot be duplicated though, are the addition of new features and the sheer pleasure of seeing your video card identified as a model that costs $100 more. Pg 4. Troubleshooting Section - What If Something Went Wrong?